Are you working as an individual programmer? Do you like to call yourself a ‘lone-wolf?' If answers to both these questions are yes, you need a Comodo Individual Code Signing certificate. Using a Comodo Individual Code Signing, one gets the ability to shrink-wrap his/her code using a digital signature. This, in turn, eliminates those pesky browser warnings stating an ‘unverified/unknown publisher.' Digital Signature allows you to attach your own unique signature and display your identity to your users. Once a user sees a publisher name that is verified by Comodo, he/she is bound to get a peace of mind. 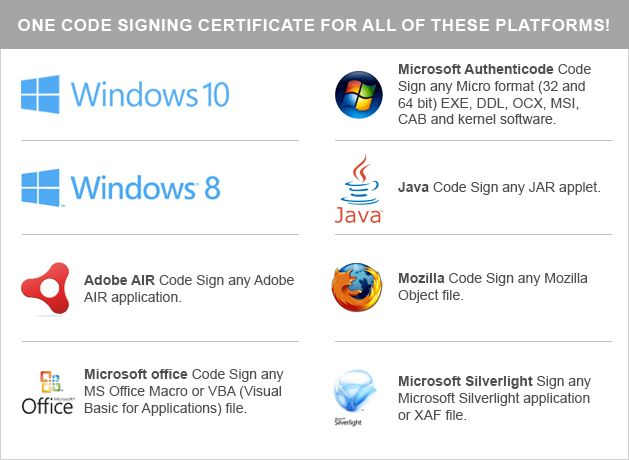 Comodo Individual Code Signing certificates are highly compatible with all the major platforms and programming languages. The software industry has evolved in such a way that you need 3rd party download sites, resellers, and marketers to reach to bigger audiences and boost your downloads. This, unfortunately, prompts illicit activities such as piracy and data-tampering. Therefore, the users must be able to identify whether the software is genuine or not. That's where Code Signing certificate comes into play. Before you issue a Comodo Individual Code Signing certificate, Comodo requires you to go through a light vetting process. Once this is done, you can showcase your identity as the publisher to the entire world. Comodo Individual Code Signing certificates protect a software code by means of a hash. When you sign your code digitally, a unique hash is generated. If your customers' browsers can re-hash this hash, then the downloaded software is safe to use. Do you know what kills your downloads more than anything else? Those annoying browser warnings, that's what. Put yourself in a user's shoes for a moment and ask yourself if you would download software from an unknown publisher. You wouldn't, right? That's why showcasing your identity with Comodo Individual Code Signing certificate is of paramount importance.